Since Overwatch came out, I have put countless hours into the game. I love the feel of the gameplay. The lore hidden in the voicelines, comics, and cinematic shorts captivate me. Also, the colorful maps are fun and diverse. Today, Overwatch released a trailer showing off a new map called Horizon Lunar Colony. The map takes place on the moon. 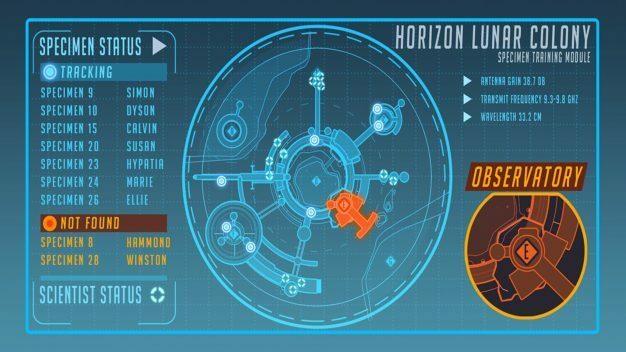 Earlier this week, the Overwatch Facebook and Twitter shared the following image of the Horizon Lunar Colony. We know from the Recall short that Horizon is where our favorite gorilla, Winston, grew up. If you read Winston’s character profile on the Overwatch website, you will know that Horizon had a group of scientists who were experimenting on genetically altered gorillas. One of those scientists, Dr. Harold Winston took an extended interest in one particular gorilla and taught him a lot about science and discovery. The other gorillas on Horizon were jealous of the special care for this gorilla and tired of being experimented on. They took over the colony, killing all of the humans in the process. The special gorilla took the name of the scientist who had meant so much to him, built his own rocket, and flew to earth where he joined Overwatch until their downfall. Getting back to the image, on the left is a list of the gorilla test subjects. At the bottom in the “NOT FOUND” area we see Winston, who we know is on earth. Hammond we have never seen, but from the images released by the Overwatch website we know he is a smaller animal. I am only going to add one of the emails here, I recommend reading up on the others here. You will see why the Observatory is orange. 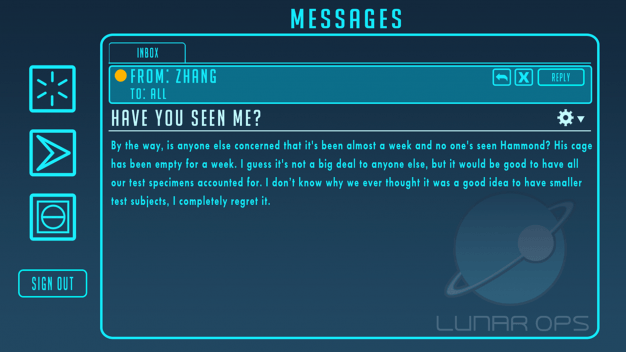 Obviously, Hammond is going to have a bigger impact on the story, whether that be a new playable hero, or just lore implications. Until we know more let’s get excited about the map itself. Overwatch is known for its colorful maps. Horizon continues this by showing life and color. The Earth looks beautiful on the outside of the station and the rooms are filled with plants and technology. The Overwatch YouTube channel released a developer update with Overwatch Director Jeff Kaplan talking a bit about the layout of the map. It will be an assault map, where the attacking team must take over two points, like Hanamura or Temple of Anubis. With Horizon taking place in space there will be sections of low gravity and when the map comes out the custom game modes will include an option to play every map in the game with low gravity. To read up on more patch notes, including hero changes and fixes, click here. There is no date for this update, but if it’s close to past updates it will be out in about three weeks.